Be the first to share your favorite memory, photo or story of Louzada. This memorial page is dedicated for family, friends and future generations to celebrate the life of their loved one. 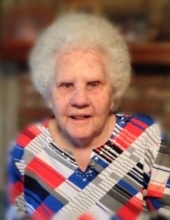 Mrs. Louzada Lee Register, 90, of Dunn died Friday, October 19, 2018 at Harnett Woods Nursing and Rehab in Dunn after a long battle with Alzheimer’s. Mrs. Register was born June 22, 1928 in Sampson County daughter of the late Jimmy and Vennie Newsome Lee. She was also preceded in death by her husband, Alonza Register; brothers Otis, Wesley and Waitus Lee; sisters, Vada Beasley and Ada Pearl Core. Mrs. Register was a member of Faith Covenant Family Church in Dunn. A funeral service will be held at 11 a.m. Monday, October 22, 2018 at Skinner & Smith Funeral Home with Rev. Joe Ammons officiating. Burial will follow at Lafayette Memorial Park on Ramsey St. in Fayetteville. She is survived by her daughter, Kathy R. Blackmon and husband Melvin of Dunn; granddaughters, Andrea B. McLamb and husband Matthew, Jamie B. Harrelson and husband Matthew; great grandchildren, Mason McLamb, Penn Harrelson and Lennon Zada Harrelson. The family will receive 5-7 p.m. Sunday at the funeral home and at other times at the home of Kathy and Melvin Blackmon. Memorials may be made to Faith Covenant Family Church P.O. Box 1388 Dunn, N.C. 28335. To send flowers or a remembrance gift to the family of Louzada Lee Register, please visit our Tribute Store. "Email Address" would like to share the life celebration of Louzada Lee Register. Click on the "link" to go to share a favorite memory or leave a condolence message for the family.